Though not truly a sequel to Black Beauty, this book touches the reader in much the same way. Joey’s life as a young colt on a British farm comes to an end as World War 1 begins. We follow Joey and farm boy Albert, who is devoted to him, on their own separate journeys through war torn Europe. Well researched, well written and a must for every horse lover. 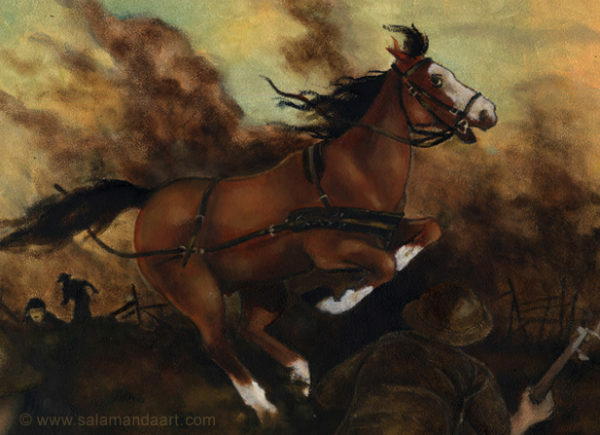 This is one in a series of images I painted inspired by War Horse. Readers will realize I’ve taken liberties with Joey’s markings for my illustration.